The Bubblehead Bride: Etsy Swap 2013 - Reveal! Etsy Swap 2013 - Reveal! Let me tell you about something fun that I recently participated in! You might remember my bloggy friend Amy (at Taking Steps Home) from the Cara Box that I did in April. She and her friend Megan are self-proclaimed Etsy addicts and came up with a fun idea to do an Etsy swap. Me, being stir crazy waiting for my girls to be born, thought it would be a lot of fun to participate! 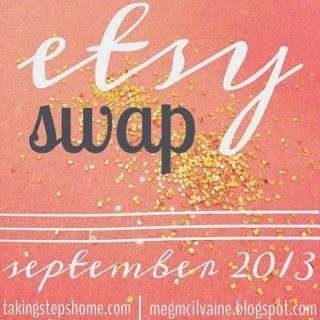 Essentially, the idea of Etsy swap was pretty simple -- bloggers signed up and get paired with a fellow Etsy lover. You stalk creep research their likes/dislikes from their social media links that were provided and find something that reflects their style on Etsy. Then you buy it and ship it to them. I was paired up with Heather at Becoming Beloved! She described her style as Simple, Natural, Outdoors-y, Colorful, and Ecclectic. This was super fun because Heather didn't know that she was my match. I got to stalk her blog and her pinterest boards and find her something she would love! It was like being a secret santa. Except not. If you want to see what I sent her, I urge you to go over and check out her blog. You won't be disappointed! The print reads, "I can't imagine life without a table between us" from the book Bread & Wine written by Shauna Niequist. This has been on my to-read list since it came out and the print is totally my style! I can't wait to hang it in the new house! Amy got this print from a website that I wasnt familiar with - Lindsay Letters. If you are into typography, especially, you have to check out their store! They have tons of great prints as well as mugs, stamps, and canvas prints. I. Want. It. All. Also included in the box were two packages of notecards, a "C" stamp, and a beautiful necklace from IMSMI. I don't know if you can see it clearly (my picture taking skills were lacking) but it has three hearts that are all connected on a gold chain. Amy said she thought it would be perfect since I had Preston and the two girls on the way. She was right! It also just so happened that I received her package on the day the girls were born. Talk about good timing! I love how delicate the necklace is and I feel like I can wear it with anything, which I love! Especially with things getting hectic here (now and in the upcoming couple of months), I am glad that I was able to participate in this Etsy swap! It is always fun getting to know other bloggers! Keep an eye out for the next Etsy swap!! yay! :) i'm so glad you liked what I got you!! Bread & wine is on my to-read list as well, it just looks amazing! And the necklace, I still love that I found it for you *and it came on their birthday!!!! So glad you participated and were my swap partner! Love your package! And I adore that necklace!! Definitely on my wish list now! i love that Lindsay Letters Print! lindsay letters was just all over this etsy swap! i love it! :) absolutely love that print...i need to read the book. so glad you got to participate!